The deadly standoff between a homeless man and six Saginaw, Michigan police officers was caught on video. CNN has purchased the video of the July 1 incident and we'll make it public for the first time tonight. The victim was 49-year-old Milton Hall, who according to his family suffered from mental health issues. He was holding some type of knife during the confrontation. According to local reports, police fired 46 shots during the standoff. CNN counted at least 30 gunshots. "It appeared to be a firing squad dressed in police uniforms. There was another way. They did not have to kill him," Hall's mother told CNN's Jason Carroll. Others in the community agree. They say police used aggressive force. 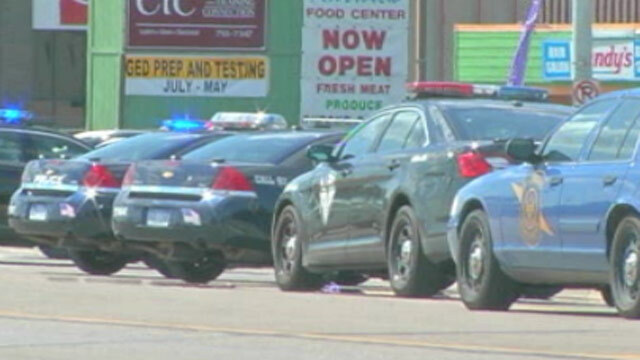 Tonight in Carroll's report you'll see how police responded to the criticism. Carroll also has the latest on the shooting investigation that's been launched by the state police. Carroll's report airs at 8 and 10 p.m. ET. Update: Watch the report below. 1 mentally handicapped man with a knife and 6 police officers guns drawn at the ready also with a k-9. The man doesnt drop the knife so in the end there is a dead man on the ground with 46 spent shell casings laying near by....I'm disturbed by this, James Holmes killed over 70 people and he's still breathing...I dont understand how the dog could not have disarmed the man or they could have put someone to the side of him with a lethal weapon and allowed a cop to move within range to use a taser and why would 6 cops need weapons drawn for 1 man with a knife but idk what to say everyone needs a huge reality check and common sense. "Serve and Protect" not "Profile and Kill"
That is quite frankly one of the most disgusting things I have ever seen. The victim only had a knife, and the 6 police officers had guns. The homeless man was clearly distanced enough where he would not have caused anyone any harm. Even just one cop could have told everyone else to put down their weapons. If they he was going to hurt one of them then I could understand one cop firing a shot to stop him. But this was a firing squad for sure. It looked like they they were just over dealing with him. That is really sad. What about cops just "disarming" threats? Not shooting at someone with enough anger to overkill. What about using someone kind of tranquilizer dart. No one deserves to be executed. Muriel, I have seen this happen numerous times in Los Angeles. It's par for the course. They are nothing but a pack of cowards who deserve to die like vermin some day. Their karma will catch up with them. Don't worry. Wow. I just saw that video and it appears to be a flat-out police execution. Don't trust the police. Don't ever trust them anywhere. There may be a few good cops in the country but they are darn few. These people are young, aggressive, inexperienced and have their own agenda. To put a gun into someone's hands like that, is sheer lunacy. Don't trust the police.... ever. So sad for a mother to lose a son that way regardless of how old he is. He clearly has mental issues in the video but your trying to tell me that out of 5 cops nobody has a stun gun or pepper spray? You can take a man down with a stun gun and pepper spray him and remove the knife. This world is coming to an end. THis is just a disgrace!!!! I think police officers need better training and loose the mentality of being so aggressive. They could have had ONE PERSON shoot him in the foot or something just to get him to drop the knife and take control. Instead they shot him up like a firing squad. THIS IS AN OUTRAGE!!!!!!!! Wow. I support law enforcement but this looked like a gang shooting. There is no way after seeing that that the police can say they used the proper level of force. Wow. look how the chief downplayed it and blamed the victim. Just for those comments, the chief should immediately fired. How do you blame the victim here. I though he was going to end by saying, this guy just cost us too much time so we just decided to make our lives a bit easier. Every no good cop that fired a bullet belongs in jail for a very long time. America needs to deal with its issue of racism once and for all. When they stop lying my telling people that white cultural and historical contributions are better than every other's groups, then and only then will they open up the opportunity for true healing in this country. God Bless America. Why in gods name do they need to shoot this man at all? I have all the respect for the incredibly difficult job OUR OFFICERS have everyday. This man could and should have been disarmed in a number of different ways. I seen the video and there is not defense for what these police officers have done. Their trainning and other means of weapons could have been attempted before filling him with bullets. I extremely disappointed in anyone that doesn't think a stun gun or one shot in the hand that was holding the knife would have been the first choice to disarm and subdue him. The fact that they are trained officers, makes their shooting criminal. This is upsetting, I don't feel protected with officers like this on our streets. Only a knife? A knife can kill you, It can kill you though a bullet proof vest, More people are killed annually with knives that they are with guns, and he "only had a knife". If brandish a knife and move towards a police officer who has repeated told me to drop the knife, I expect to get shot at least once. Milton Hall had a history of violence in the past, He said he would kill the police dog,(that is actually considered an unarmed police officer.) A taser is not guaranteed to stop anyone. It won't puncture a good rain coat when you get down to it. Only a knife. Do those police officers not have the right to protect themselves and return home to their family at night because someone "only has a knife". Give me a break. "Where is your thoracic cavity? " Put that question on your ridiculous list for stupid questions asked by your host. I realize she asked to clarify for viewers. Are people that stupid? If they are, they're not watching the news. Well if anyone who watched that video tonight doesnt agree that this a terrible case of police brutality well then we may as well give our police officers total antonimy to shoot any time they please , a 46yr old man with a knife vs 7 police officers and a dog at a 20 ft distance between them , police on a power trip , they all should be charged with 3rd degree murder !!!! my GOD what is America comming to? The victem only had a knife? Why all of this? Have we as American's lost ANY COMMON SENSE we used to have? You would have to be from saginaw to understand,According to new data from the FBI, Saginaw is once again considered highest for violent crime in the nation. Maybe this would help you understand.